Walking is good exercise whether you have two legs or four. But you wouldn’t be happy to trot around your backyard, and dogs aren’t, either, veterinarians say. Dogs are tens of thousands of times as sensitive to smell as humans are, so a long, sniffy walk stimulates their brains, gives them opportunities to socialize with people and other dogs and helps them keep the pounds off. It can also help prevent behavior problems, according to A Modern Dog’s LIfe, by University of Sydney veterinarian Paul McGreevy. Some dogs, especially working breeds and sporting dogs, would be happier with multiple walks a day. 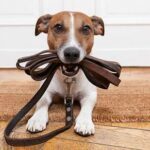 Now, we know what you’re probably thinking: “This is a dog walking company just trying to sell me on their service!” You caught us! But whether you choose to have one of our walkers take your pet for a spin, or take the lead yourself, get it out there. Your dog will be happier, less prone to obesity and other health problems and more relaxed around the house.